3) You can be part of our GoodNews bumper stickers campaign. If you send us your mailing address we will courier you a bunch of bumper stickers to hand out to your friends and family. Encourage them to put a bumper sticker on their windshields so that we can help increase awareness about the website and spread positivity throughout Pakistan. 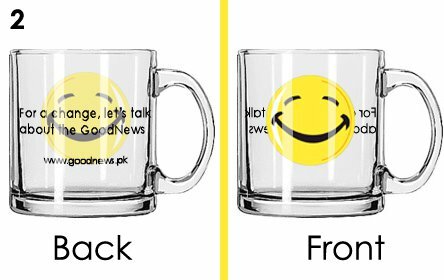 4) We have ongoing ‘Sponsorships Shout-outs’ for various GoodNews memorabilia like bumper stickers, mugs, T-shirts etc. 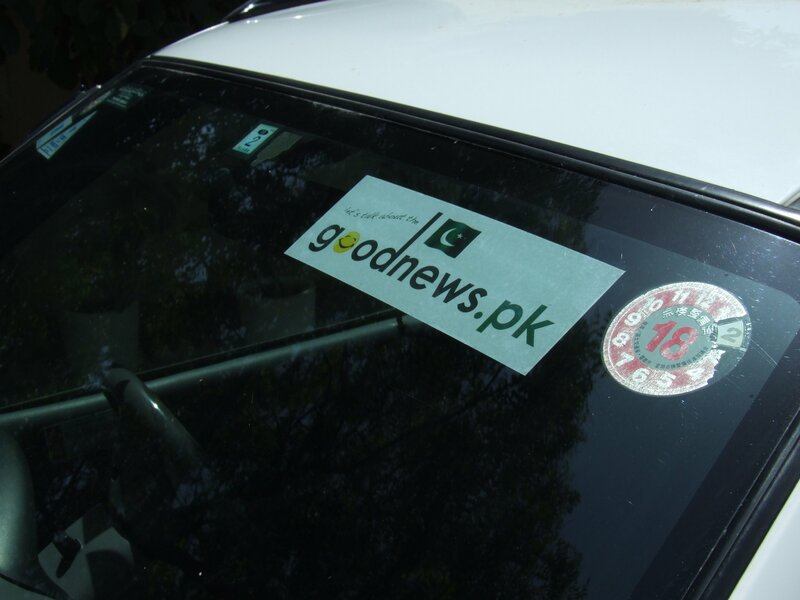 If you would like to sponsor GoodNews monetarily, you can sponsor a set of items that will be used to promote the site and spread positivity throughout Pakistan and beyond. Sponsors are entitled to pick-up of up to 50% of their sponsored items. So for e.g. if you sponsors 10 GoodNews mugs for Rs. 150/each, you are entitled to pick-up 5 of them. The GoodNews team will decide strategically where the rest of the 5 mugs should go and we try to send them to high-visibility people like famous CEOs, activists and sportspeople. Over the last 6 months we have received over Rs. 30,000 from our fans for such sponsorships which has been an amazing response. Hey. I am admin at KarachiTips. We love your site and would like to endorse you on our page. Would that be okay? 🙂 Do you have a Facebook page? The shortlink is now active! I highly appreciate the theme of goodnews.pk because instead of being part of the media war against Pakistan they are presenting a better image of Pakistan. So mostly the negative aspect is highlighted. Awesome quotes Ibn Hanif! The point about the sports section is priceless – the sport pages always seem so much happier and uplifting than the others with people jumping for joy, raising trophies, hugging and being triumphant. I wonder what it is about Sports that makes it so so much more celebratory than other aspects of human life. Maybe its because its a formalized, regulated and respectful form of competition, whereas politics, social life, foreign affairs etc. are no holds barred. Thanks for the awesome comment! Hey. I mailed you guys yesterday regarding a couple of initiatives. Please check and let me know what you think! 🙂 Kudos to you guys for this effort which is truly a breath of fresh air. Hello Batool. Thanks for the heads up. We couldn’t seem to locate your email. Could you resend it to: news@goodnews.pk? My heartiest congrats on undertaking this important mission. I have always maintained that blaming others for our own shortcomings and inactions is sheer stupidity. This is the right kind of proactive approach to promote the cause of Pakistan. Great concept, lovely website. At least It has given me reasons to consider myself Pakistani again. Hats-off to you and May you prosper. I will do my best to support in any way i am capable of. Thanks Uzair. We need all the help and support we can get. Especially with spreading awareness about the site and our related initiatives. Keep up the good work guys. I am promoting your site on my facebook wall. I hope you get more attention. congratulations of this wonderful initiative, checkout my blogs on wordpress, I am also promoting self employment amongst our youths and women, lets try to walk together? Could you please re-send the mail?